The Leviathan Trilogy #1. Author: Scott Westerfeld. Summary: An alternate-world retelling of the beginning of World War I. The Austro-Hungarians and Germans rely on steam-driven iron machines known as Clankers. The British Darwinists employ fabricated animals as their weapons. 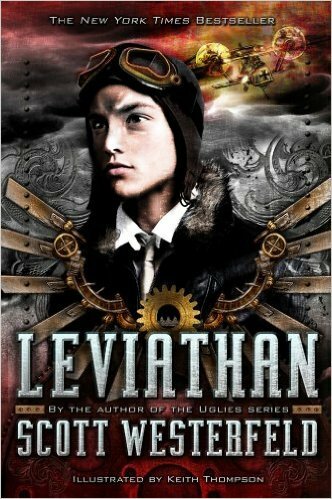 Their Leviathan is a whale airship, and the most powerful beast in the British fleet. My Thoughts: I enjoyed it. It’s a little slower-paced than some, but this wasn’t a problem for me. The atmosphere is clean steampunk. Both protagonists are interesting – one a midshipman on the Leviathan, a position she’s dreamed off; the other a nobleman’s son, who doesn’t quite understand the powerful forces around him, but he’s climbing rapidly out of childish innocence of the war. Content Review: Sexual content: None. Language: No colloquially recognized language – scattered instances of made up words recognizable as counterparts, e.g. clank, diddle, sparks. Violence: A number of airplanes are shredded by fletchetts, a flock of bats is killed by a plane, there is a sword fight and one of the fighters is killed.